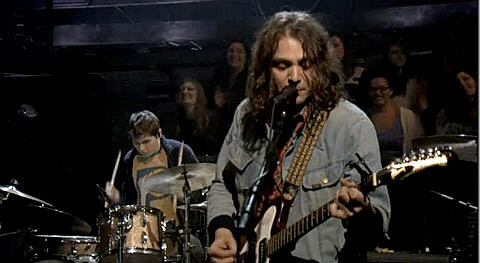 The War On Drugs played Late Night with Jimmy Fallon on Tuesday (1/10), their TV debut. They performed “Baby Missiles” off of their 2011 LP, Slave Ambient, which was one of our favorite records of 2011. ?uestlove, who DJs Brooklyn Bowl tonight (1/12) joined the band on drums, playing in unison with the band’s actual drummer. Check out the video of their performance below. The War On Drugs will head out on a tour soon, which brings them to NYC on April 6 at MHOW. Tickets are still available. The tour includes some dates with White Rabbits, who just announced their own tour, which hits NYC on April 12 at Webster Hall. Tickets for that show are on AmEx presale and go on sale to the general public Friday (1/13) at noon. Their tour also includes many dates with Sharon Van Etten who also just played Fallon and has a MHOW show of her own coming up as well (but one at Mercury Lounge even sooner). Questlove DJs Brooklyn Bowl tonight (1/12).